Hurme FIN is a simplified monolinear sans-serif design with a large design-space from Expanded to Compressed family variants. Horizontal stroke terminals. Short ascenders and descenders. Optically adjusted Obliques. The x-height increases proportionally towards the narrower family variants. Nine widths, eight weights. In total 144 styles. 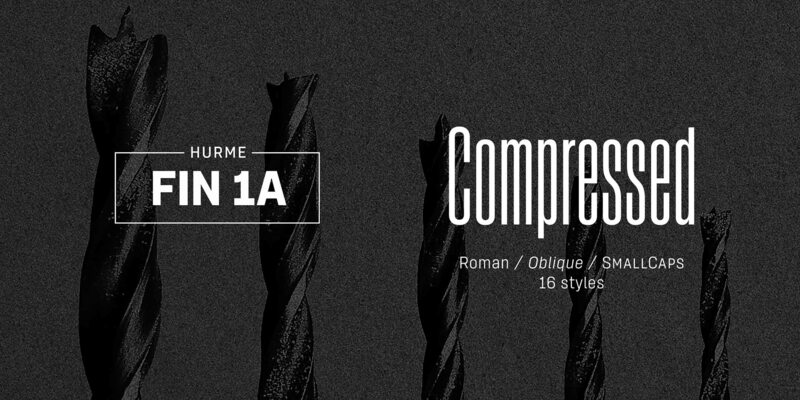 Hurme FIN 1b is an alternative design of FIN 1a, featuring angular and monospace -inspired characters with slab-serifs. FIN 1b can be seen as a transition between monospace Hurme FIN Mono and more grotesque FIN 1a. Hurme FIN 1a and FIN 1b are essentially the same fonts, but with different sets of characters set as default. In both family variants, all the other characters can be accessed through the Opentype features. When buying FIN 1a, you will receive corresponding weights of FIN 1b free of charge. Under Purchase options, please select the style and add the licences/quantities you need for each style. After your payment is done, you will receive the font files within minutes. If you have any questions or need technical support, please contact us.